U.S. stocks slipped on Friday on concerns regarding China’s navy seizing a U.S. underwater drone in international waters in the South China Sea. Equities ended the week narrowly mixed with the Dow Industrials climbing within 0.5% of 20,000, and for the week, outpaced the broader S&P 500 and NASDAQ Composite, which fell fractionally. Financials edged lower for a third day last week, losing just over 1% over the past five sessions. Even so, strong gains in banks have led the broader financials group up more than 17% since Election Day, outpacing a comparable 14.3% gain on the Russell 2000, a measure of small cap performance. For the week, the S&P 500 slipped -0.03%, the Dow Industrials increased by 86 points (+0.43%), and the MSCI EAFE (developed international) fell by -0.55%. Since the Federal Reserve’s November policy meeting, President-elect Trump’s rhetoric promising fiscal expansion and tax reform have spurred reflation in the U.S. economy. This is reflected in the FOMC’s December upward revisions to near-term growth and inflation forecasts, and some downward revision to the unemployment rate. Higher median projections for the federal funds rate in each year after 2016 suggest that the move is a “hawkish” trending hike. 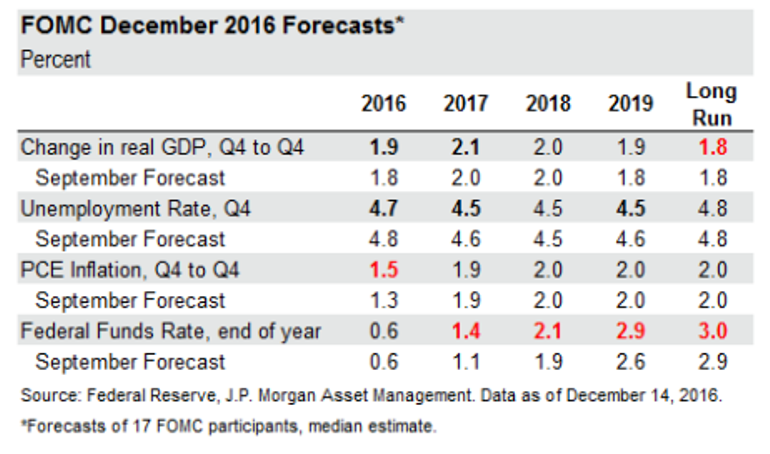 According to strategists at J.P. Morgan, these longer-term projections are more likely to be realized if economic growth is stoked by fiscal expansion, because expansionary fiscal policy lessens the need for accommodative monetary policy. With so much uncertainty around future fiscal policy, Wall Street is left to assess risks both to the upside and downside of the Federal Reserve’s median scenario. First, if the bullish scenario of stronger growth and inflation falls short of expectations, it could cause a hiccup in financial markets and deter the projected increases. The second scenario is that more expansionary fiscal policy combined with a tight labor market could cause inflation to pop faster than anticipated, leading to more aggressive monetary policy tightening and an ever-strengthening dollar.